The Step 2 LifeStyle Deluxe Kitchen is a great playset that girls and boys alike will enjoy playing with. Inevitably, parents will love how this pretend play set gets their children’s attention all day. Parents want toys that their children could grow up with. They would likely not buy things that end up in the garage sale after a few months. This playset is a rather large unit. It looks even more massive than Kidcraft playsets. Unless you have lots of space in your home, consider clearing and moving some chairs to find a place for this playset. The appliances in your kids’ kitchen make sounds that are not annoying. They are realistic which adds to the Wow factor for this set. The tools such as the microwave oven, dishwasher, and the cordless telephone emit sound effects that your kids will enjoy. The drawers and cabinets offer a lot of space for keeping your kids’ playthings. They will also have a great time trying to organize the pans and pots and where to put the play foods. 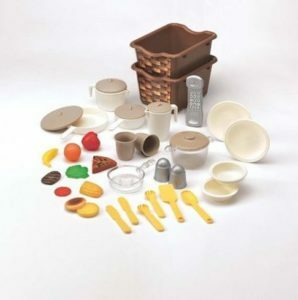 With the 38-piece accessory set included with the playset, you might want to add more play foods and a set of chrome pans for added enjoyment. It is complete with coffee maker, dishwasher, stove, microwave oven, and refrigerator. The ref also has an ice maker just like the one in your kitchen, maybe. It would be a lot of fun to put all the play foods in the appliances and “cook” them. Your kids and their playmates will have so many things to do with the tiny pans and pots of this toy set. If you bought it for your daughter, don’t be surprised to find her older brother playing with it too. It is non-gender specific because it is not sprayed all over with pink flowers. The color scheme is neutral so it can attract your daughter and son. They will probably adore the framed window with the farm view outside. They will have hours of creative play with this toy set. You can get all kinds of replacement parts for this playset directly from Step 2 or on eBay. My friend got her daughter the Lifestyle Deluxe Kids Pretend Kitchen two months ago, and the little girl got so excited. She couldn’t stop playing with it, and her mom couldn’t stop talking about it either. So, I decided to do some research and find out what was so amazing about the playset. In my research, I discovered that kids can use the device to pretend-play in the kitchen. It is indeed a playset with most of the things you would find in your own kitchens such as a microwave, refrigerator, oven, and dishwasher. When you buy the playset, it comes with play food (how nice is that? ), dishes, and pots and pans which make sounds that convince your kids that they are cooking, the same way you have cooking sounds in your kitchen. I have found that most kids are fascinated by the sounds that the stove, dishwasher, and microwave make. Children like to copy their parents, and hearing those sounds makes them feel like they’re cooking, just like their moms and dads. 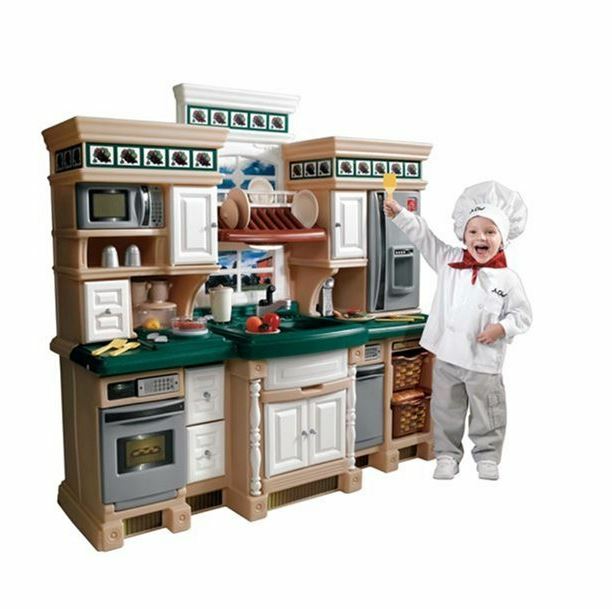 Another thing that children love about the Lifestyle Kitchen set is that it is large with enough room and items. Therefore, they can play with their friends for hours, and not fight over playing with the device because everyone can play with a different utensil. Children enjoy playing with the drawers and cabinets, and they love the fact that there are several of them. We know children (especially girls) like to rearrange items, and the kitchen set gives kids the freedom to do that through its drawers and cabinets. One user mentioned it is easier to put it together if you mark the parts before assembling. A power screwdriver will help speed up the assembly process as well. The individual items have buttons with them, and all have a unique sound which makes the experience of playing this all the more real. The stove makes boiling and sizzling noises, and the oven noise is excellent too, which is rare in such toys. Kids and parents love the very realistic burner that comes in this set. Some parents have also added in extra plastic vegetables and accessories to spruce it up for the children, to great response. Other users have commented that this is great for growing children as they can play with it for long times to come and will not outgrow it too quickly like with most other toys. Different aged children love this in different ways, while the younger ones enjoy it as it is, the older ones love the mechanisms and possibilities. The stickers are also loved by customers for adding a nice touch to the whole thing. The size too is decent, it is not too large for a child’s room, yet not too small either. Replacement stickers are available for ordering online. One of the things that the Lifestyle Deluxe Kids Pretend Kitchen users can agree on is its durability. It is incredibly sturdy which is excellent because kids can easily damage items while playing. The plastic is very durable and sturdy and will not wear out very soon. It is also very sturdy and not easy at all to push over. It does not have the hazard of children accidentally destroying it by pushing it. The play set comes with its pots and pans. Therefore, parents don’t need to spend extra on those items. Another great thing about the device is that it is spacious which is uncommon for most kids’ play items. It is fun putting it together, and this alone keeps the children busy for a long time. The playset also comes with a lot of buttons which kids love to push for the sound effects. This keeps children of all ages busy with the numerous things one can do here. It gives them something to think about and lets them pick their brains. There are some challenges associated with using the Pretend Kitchen. For example, some parents who have bought the toy for their kids say that it requires a significant number of batteries. Some users have even attested to using both AA and AAA batteries. Certain parts of it cannot be entirely operated by young children as it requires a bit of strength. The dishwasher and oven door is hard to open if the child is very young. One will need an additional screwdriver to insert a few screws. The second challenge is that some users find it difficult to put assemble the different parts of the play kitchen. It takes some people 45 minutes and others up to five hours. However, users discovered that using a power screwdriver to screw the controls makes the process easier and faster. And the good news is that the set has to be assembled only once. Although some people have said the toy is overpriced, others have contradicted it claiming that the toy lasts for years to come and serves the children well, so the price is justified. Given one does not have to repurchase toys over the years in exchange for this, it is a pretty good deal. If you are looking for the lowest price, you can check out Craigslist and eBay to see if used playsets are for sale. I have also seen pretty sweet deals on Amazon and Walmart, so I suggest to check out these places as well. This has been a good Christmas present for a lot of people who are confused about buying their youngsters toys for the holidays. They adore how kids fall in love with the Step 2 LifeStyle Deluxe Kitchen and are awed by the features and size of the toy.